Hannibal’s campaign to defeat Rome continues as he marches south to confront his enemy. With him is a young soldier, Hanno. Like his general, Hanno burns to vanquish Rome. Never has the possibility seemed so likely. But a stealthy game of cat and mouse is being played as Rome’s generals seek to avoid confrontation. Eventually the two armies meet under a fierce summer sun. The place Cannae – the fields of blood. The battle will go down in history as one of the bloodiest ever fought, a battle in which Hanno knows he must fight as never before – just to stay alive. @jdederby: Many apologies for not replying for so long. Thanks for your message. I don’t find Egyptian history nearly as interesting as Roman, I’m afraid, so I can’t say I’ll ever write a book about it. Greece – maybe – but Christian Cameron does such an amazing job that it would be hard to even come close to his books. WW2? Maybe…one day. Best wishes! I love your books and I am now on a reading binge on all things roman. Silly question here, when will part 2 and 3 be available for kindle in the U.S.? Thanks. First and foremost, I am a huge fan. I recently finished the forgotten legion series, and just finished the first book in your Hannibal series. I haven’t been able to put them down. 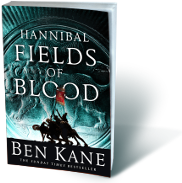 However, I live in the U.S. and prefer hard cover books but have not been able to find “Fields of Blood ” in hard cover, or that is not the international version, so my question is two-fold. 1) Can you refer me to a distributor in the U.S. that has the hard cover version, and 2) If not, is the international version different than an English translation in the U.S, and if so could you provide a few examples? Thanks!!! big fan! So so sorry for not replying until now – I tend to use FB and Twitter mostly nowadays. I’m also sorry to say that part two won’t be out for another 12 months or so in the USA. My American publisher has changed the date. The third book won’t be out for a year after that either, so you might want to go to thebookdepository.com and order from there – or Amazon Canada. Thanks! Hi Aaron, and sincere apologies for not replying sooner. I’m delighted you enjoy my books. To answer your questions: 1) No, I can’t, sorry. 2) The international version will have a few differences to the US one, but they’ll be small – ‘colour’ vs. ‘color’ etc. Cheers!